Although Captain America was killed off by Marvel Comics several years ago, his spirit lives on in the hearts of many superhero fans. In this patriotic era, his American flag costume is more popular than ever in costume stores, but you can easily make your own at home. Cut several inches off the bottom of a blue t-shirt. Put the blue t-shirt over a white one. You will be wearing them together, with the white one underneath and the blue one serving as the outer layer. Measure the length from the bottom of the blue t-shirt to the bottom of the white one. Cut red felt strips equal to this length and about 2 inches wide. Glue or sew red strips of felt around the white shirt. They should be spaced about 2 inches apart. It will give the appearance of the red and white American flag stripes on Captain America's costume. Measure the circumference of the bottom of the white shirt sleeves. Cut two strips of red felt to that length, making them about 4 inches tall. Glue or sew one around the wrist of each sleeve. Cut out a white star, about 6 inches wide, from white felt or fabric. Sew or glue this to the front of the blue t-shirt. Your shirt is complete. Measure the circumference of the bottom of the blue pant legs. Cut two strips of red felt to that measurement. They should be about 4 inches tall. Glue or sew one to the bottom of each pant leg. Now your pants are complete. Improvise for the helmet. You could use a blue balaclava, cut out a letter "A" from white fabric and glue or sew it on. You can also improvise with a blue baseball cap worn backwards. Put the "A" on the back of it, which is the side you will be wearing on the front of your head. Use any of several methods to make the Captain America shield. Cut a large circle out of poster board or foam board and paint it. If you're handy with paint, you can use a snow disc, a barbecue grill cover or a large wok lid to make the shield. Wear long red socks and red tennis shoes as well as the helmet to complete your costume. Carry your shield with you and you are Captain America! 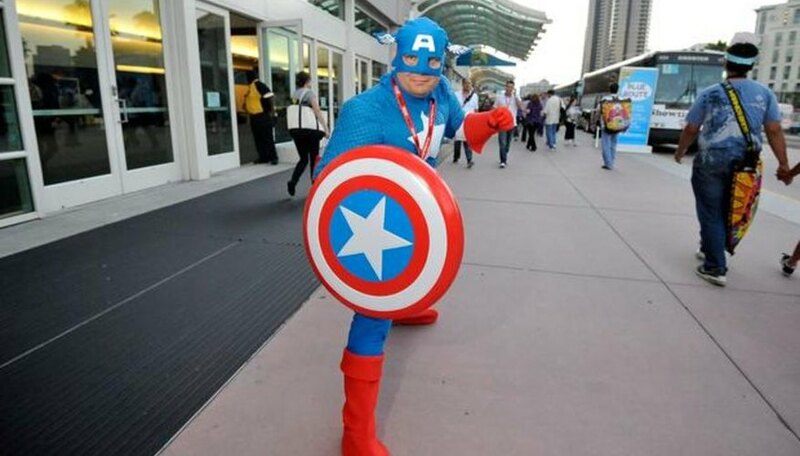 Make an old-style Captain America costume. This is the costume that's more popular. The updated version is not nearly as beloved or well-known.